Maybe you just got your car washed and polished and everything is looking great, well almost everything. It’s your wheels, something’s got to be done about your wheels. Let’s assume that you have a fairly new set of chrome wheels on your vehicle, but over time they have gotten a little bit dirty, but aside from your wheels everything else on your vehicle looks pristine. Maybe you’re planning on taking your car to an auto show or maybe you have a date but in any case you don’t want your car’s otherwise perfect appearance to be marred by a set of dirty chrome wheels. So what’s a person to do? 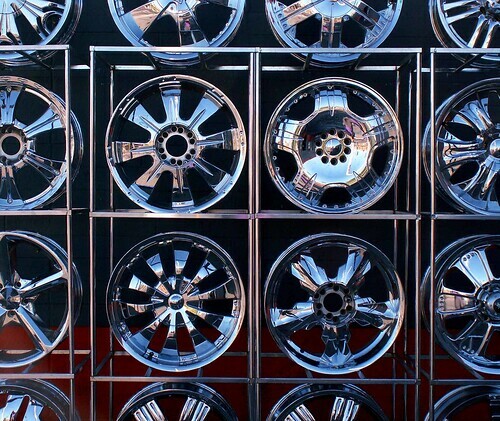 Chrome wheels like weld wheels are different steel or carbon fiber wheels; in fact, chrome wheels are in a whole different class from the standard wheels that are outfitted on an average dealership car; chrome wheels require real care and attention if you want them to look their best. It doesn’t matter if you have car wheels, truck wheels or any other kind of chrome wheels. The number one rule when cleaning chrome wheels is to never use an abrasive cleaner or brush, if it not something you would use on a piece on glass then it’s also not something you should be using on your wheels. The first step in cleaning a set of chrome wheels is rinsing them off with a simple garden hose or power washer. It’s rare that you will have any debris that is attached to your chrome wheels that won’t come off with a little water, but if you encounter a few stubborn pieces of dirt then use a damp cloth or sponge to remove the debris instead of a brush. Everyone has their own opinion of what cleaners are best to use on chrome wheels but like many cleaning jobs it’s a good idea to start with plain soap and water first before progressing to the heavy cleaners, if necessary. Here’s where it gets tricky, though. Even if you are using just plain soap and water to clean your vehicle’s wheels you also have to make sure that the soap does not have any harsh chemicals that might harm your wheels such as oxalic or hydrofluoric acid; in fact, just avoid any soap or cleaner than has any kind of acid or ammonia in it. Cleaning your chrome wheels with harsh chemicals and acids can be dangerous because these chemicals can often permanently stain the chrome finish and cause spotting. Regardless of whether a person uses wheel cleaner or wheel polish or not it’s usually a good idea to dry off your chrome wheels yourself with a chamois or soft cloth, instead letting them air dry to prevent the appearance of water spots. And if possible when drying your chrome wheels try to use a microfiber cloth in order to reduce the likelihood of scratching the surface of the wheels. After your wheels have dried off consider using a good chrome polish to really bring out their shine. Nobody like dirty car. people use clean car. they use rim cleaner for their car.which chrome you recommended?